The purpose of this memorandum is to provide you with information on the Agency's actions regarding fiberglass and the Hazard Communication Standard (HCS). On May 20, I transmitted a memorandum to your attention which included Assistant Secretary Scannell's May 6 letter to Mr. Richard Munson, Chairman, Victims of Fiberglass, along with a March 28 memorandum from the Directorate of Health Standards Programs which presented a review of the scientific literature linking exposure to fibrous glass in fiberglass production workers to an increased mortality rate from respiratory tract cancer. Since that time, OSHA has issued a news release on fiberglass which clarified that the requirement to place warning labels regarding potential carcinogenicity on fiberglass products and to provide information on carcinogenic effects on MSDSs is part of the information transmittal requirements under the HCS. This requirement is not the same as the Agency regulating fiberglass as a carcinogen; at the present time, exposure to fiberglass is regulated under the PNOR (particulates not otherwise regulated) PEL of 15 mg/m(3) (5 mg/m(3) respirable). One statement which we would like to clarify on the (attached) news release occurs in the fourth paragraph, which states that there is "no requirement to identify any target organs on fibrous glass warning labels." This statement was intended to indicate that there is no requirement to identify the target organ for carcinogenic effects. With regard to fiberglass, it would not be necessary to warn of "lung cancer"; the mention of "cancer" (or "potential carcinogen" or "carcinogenic", etc.) is sufficient itself without mention of the cancer target site. However, consistent with OSHA's long-standing policy on labeling requirements under the HCS, fiberglass' (and all other hazardous chemicals') warning labels must state the target organ effected for health effects other than cancer. For example, other health effects have long been established as being associated with exposure to fiberglass, such as skin, lung and eye irritation. These health effects, which are based on the target organ effected, must appear on the label. It is important to note, also, that the epidemiology studies upon which the Agency based its statement with regard to fiberglass and carcinogen labeling presented evidence that had been collected on fiberglass production workers. Other forms of glass fibers not specifically considered in these studies may or may not have similar health effects established in the available scientific literature. Hazard communication information transmittal requirements are specific to the substance to which it applies. As the attached letter to Mr. Anthony J. Thompson points out, hazard determinations are not to be based on analogy to another substance, but rather must assess existing data on the specific material under consideration. Also attached for your information is a copy of another letter (to Mr. Don L. Cross) which presents further discussion on the issue of fibrous glass product labeling. These letters may be useful to you in responding to inquiries on this subject. If you have any further questions, please feel free to contact Melody Sands of my staff at (FTS) 523-8986. The U.S. Labor Department's Occupational Safety and Health Administration (OSHA) today reaffirmed that while it does not regulate fibrous glass as a carcinogen, manufactures are to identify it as a potential carcinogen on warning labels and provide information on material safety data sheets (MSDSs) required by the agency's hazard communication standard. "Recently there has been a great deal of confusion about health risks posed by fibrous glass," said Gerard F. Scannell, OSHA's administrator. Safety Emporium has all kinds of labels for assisting with your OSHA compliance needs. 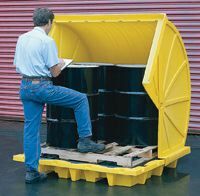 OSHA requires that manufacturers and importers of fibrous glass and other hazardous materials advise employers and employees using their products of various health risks suggested by toxicological data through warning labels on containers and more detailed information on the MSDSs. This requirement ensures that employers and employees receive as much information as possible, as soon as possible, to carry out their jobs in a safe and healthful manner and make decisions about proper protective measures to be taken in their workplaces. "We want to make clear," Scannell added, "that for fibrous glass this includes transmittal of information suggesting potential carcinogenicity. There is, however, no requirement to identify any target organs on fibrous glass warning labels." While OSHA does not set forth specific label language for fibrous glass products, the warning statement must contain information on possible carcinogenicity. "Our understanding is that major producers of fibrous glass are providing, and will continue to provide, appropriate MSDSs and are properly labeling their products in line with our hazard communication standard," said Scannell. While OSHA currently has a permissible exposure limit (PEL) for airborne particulates not otherwise regulated, which includes fibrous glass, the agency does not have a specific PEL for the substance nor does the agency regulate it as a carcinogen. In any case, OSHA does not "ban" substances, but sets PELs. "The agency is currently considering establishing a PEL for workers using fibrous glass products in all industries," notes Scannell. "We are beginning this effort to continue our mission of protecting American Workers." Thank you for your letter of August 21, to Mr. Douglas Fuller, requesting a clarification of the Occupational Safety and Health Administration's (OSHA) Hazard Communication Standard's (HCS) requirements as they apply to textile glass fibers. You specifically expressed concern about OSHA's position that fibrous glass products are to be considered as a carcinogen for product label and material safety data sheet (MSDS) purposes. You stated that "I am concerned that this position does not differentiate between glass wool and textile glass fibers" and asked "if it is OSHA's intent to require that all fibrous glass be treated as posing a similar risk." 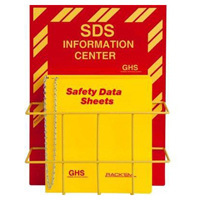 Hazard determinations under the HCS are substance-specific, and data required under OSHA's HCS to be reported on MSDSs and product labels is specific to the information available for the particular hazardous chemical. The HCS, 29 CFR 1910.1200, requires employers to perform a hazard determination for the product(s) they manufacture to determine if, under normal conditions of use or in an emergency, workplace handling or use of their product could result in employee exposure to a hazardous chemical(s). OSHA does not perform these hazard determinations for employers; rather, it is up to the employer to consider all available scientific evidence concerning the hazardous effects of that chemical. No testing is required and the evaluation may be based solely on information currently available in the scientific literature (see 29 CFR 1910.1200, paragraph (d)). If statistically significant evidence exists that exposure to the textile glass products you manufacture (you specifically mentioned "glass wool" and "textile glass fibers"), or the fibers emitted during workplace handling of these products, is or has been associated with a health effect from those exposures, then that information must appear on the MSDS, and appropriate hazard warnings conveying that information must appear on container labels for the product. As discussed above, the hazard determination, in this regard, is your responsibility as the manufacturer to perform and substantiate. You must identify the studies that involve the type of fiber you produce. Hazard determinations are not based on analogy (as to the recent OSHA news release on "fibrous glass"), but rather must assess existing data on the specific material involved. If the material is not available for exposure due to its physical form, this should also be factored into the hazard determination. For example, if fibers are not ever of respirable size, inhalation hazards would not be of concern. For your further clarification on this subject, we are enclosing a copy of OSHA's compliance Instruction on the HCS, CPL 2-2.38C. A copy of the Agency's July 28 news release on this topic is also included for your reference. We hope this has been responsive to the concerns you raised. Please feel free to contact us again if we can be of further assistance. Thank you for your letter of August 22, to the Occupational Safety and Health Administration (OSHA), in which you requested a clarification of the application of the requirements of the Hazard Communication Standard (HCS), 29 CFR 1910.1200, to continuous glass filaments. You specifically were concerned about the requirement that continuous filament (also known as, according to your letter, "textile glass fibers") products bear a carcinogen warning label. The HCS requires employers to perform a hazard determination for the product(s) they manufacture to determine if, under normal conditions of use or in an emergency, workplace handling or use of their product can or could result in employee exposure to a hazardous chemical(s). OSHA does not perform these hazard determinations for manufacturer; rather, it is up to the manufacturer to consider all available scientific evidence concerning the hazardous effects of that chemical. No testing is required and the evaluation may be based solely on information currently available in the scientific literature (see 29 CFR 1910.1200, paragraph (d)). In your letter you mention that the International Agency for Research on Cancer (IARC) "concluded that continuous filaments are not classifiable as carcinogenic to humans" and therefore, you requested that OSHA "confirm" that no carcinogen warning label is needed for these products. IARC is recognized in the text of the HCS itself as one source manufacturers of hazardous chemicals must consider regarding a chemical's carcinogenicity, but it is not the only source. For health hazards including carcinogenicity, evidence which is statistically significant and which is based on at least one positive study conducted in accordance with established scientific principles is considered to be sufficient to establish a hazardous effect. Get your spill control pallets and more at Safety Emporium. If statistically significant evidence exists that exposure to the textile glass or continuous glass filament products your client manufactures, or the fibers emitted during workplace handling of these products, is or has been associated with a health effect from those exposures, then that information must appear on the MSDS, and appropriate hazard warnings conveying that information must appear on container labels for the product. As discussed above, the hazard determination, in this regard, is your client's responsibility as the manufacturer to perform and substantiate. The manufacturer must identify the studies that involve the type of fiber they produce. Hazard determinations are not based on analogy (as to the recent OSHA news release on "fibrous glass"), but rather must assess existing data on the specific material involved. If the material is not available for exposure due to its physical form, this should also be factored into the hazard determination. For example, if fibers are not ever of respirable size, inhalation hazards would not be of concern. For your further clarification on this subject, we are enclosing a copy of OSHA's compliance Instruction on the HCS, CPL 2-2.38C. A copy of the Agency's July 28 news release on fibrous glass is also included for your reference. A copy of this letter to you will be transmitted to all of OSHA's Regional Offices in response to your concerns regarding labeling of the products you mentioned. Please feel free to contact us again if we can be of further assistance.